There’s nothing more traumatizing for a business owner than to have their small business audited. Running a small business can be challenging enough, but can become more stressful with the IRS auditing you. While the prospect of an IRS audit may be scary, you can lower your odds of being audited by avoiding certain actions that the government considers to be red flags. 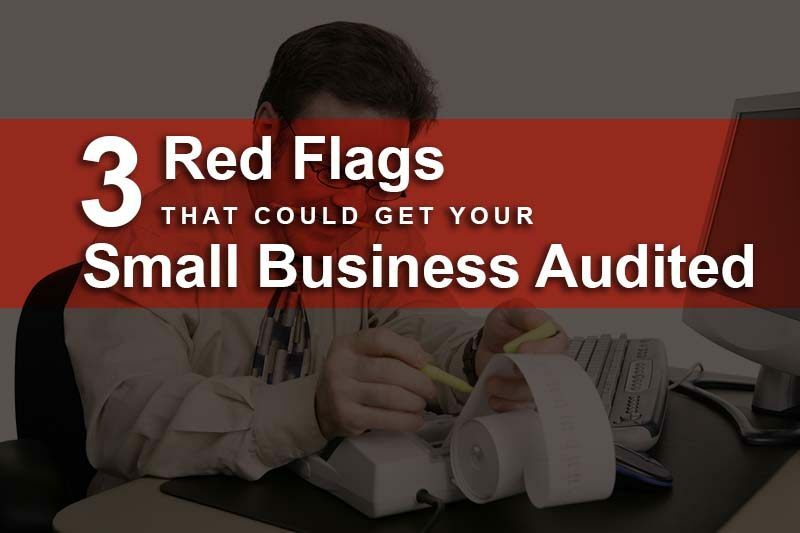 Our expert CPA’s highlight a few red flags that could lead your small business to get some unwanted attention from the IRS? If your company doesn’t make a profit in at least two out of every five years, the government may consider your business to be a hobby. While you should take every deduction that you are entitled to, be aware that your audit risk increases with each year, you spend in the red. Make sure that you keep good records to justify your losses. Typically, a business owner will use his or her personal vehicle for business trips or to travel to business lunches. However, the IRS knows that some people will try to claim that their personal vehicle is solely used for business, which is unlikely. As with anything tax related, you should keep good records to justify the miles and other expenses that you write off related to the business use of your vehicle. Restaurants, car washes and other companies that do a lot of cash transactions could be in for extra scrutiny from the government. This is because it is easier to hide money or otherwise fail to report it come tax time. While it may be tempting to shelter some of your money elsewhere or simply not tell the IRS about it, it could lead to fines and penalties later that could negate any potential gain. How Does a CPA Help? A CPA can help you organize your receipts, invoices, and liabilities into a coherent set of records. When the IRS comes calling, you can refer to these records to show that you have been complying with tax laws and are engaging in legal tax avoidance as opposed to tax evasion. Having clean books can also help when applying for a loan, asking for outside investment or when you attempt to sell your business. There is no surefire way to know whether or not your company will get audited in a given year. Fortunately, the overall audit rate is around 1 percent, which means that your odds of dealing with the government in any given year are low. However, if you are facing an audit or simply want to get better organized, give Larry L. Bertsch, CPA a call today.